* Members of Congress will always prefer imaginary budget cuts as long as government spending gives them real power. * The more money a program wastes, the more gratitude beneficiaries show to politicians. Campaign contributions and reelection rates trump audit reports every time. * Unless average Americans can somehow convert their household debt into the world’s reserve currency, it is difficult to see what lessons Uncle Sam can teach them about managing money. * We cannot expect a good-faith reduction in political power from politicians. * Washingtonians view government spending as the equivalent of magic beans that automatically sow blessings across the nation. Any claim of a “multiplier” is treated as a revealed truth. * The size of the federal budget is one of the clearest gauges of the power of the political class over the rest of America. And anything that increases political power will be favored by many politicians. * The failure of a government policy does not merely reduce the number of bureaucrats who receive “outstanding achievement” job evaluations. Every waste of tax dollars undermines the legitimacy of the entire political system. *Until politicians feel an electoral knife at their throats, it will be business as usual — with a little “Greek-style” dressing thrown in to delude people that problems are being solved. It is only a question of time until Washington is convulsed by the next federal budget crisis. Unfortunately, neither major political party is offering substantive proposals to curb soaring federal outlays. And Washington itself is inherently unable to recognize the true threat of government spending to Americans’ future and freedom. It was a common saying in the 1930s that “we cannot squander our way to prosperity.” But inside the Beltway it is unimaginable that the government could be dragging the nation down. The evidence of the benefit of government spending is everywhere — from the booming local economy, to the lofty real-estate values, to ample opportunities for anyone with a college degree and a willingness to spend his life writing unread memos. President Grover Cleveland declared in 1893 that “the waste of public money is a crime against the citizen.” But today’s Washington experts take a theological view towards floundering programs: almost every program can be redeemed with a few more years and more billions of dollars. For instance, the National Academy of Public Administration declared in 1994 that if the Department of Housing and Urban Development (HUD) were not operating “in an effective, accountable manner [within five years,] the President and Congress should seriously consider dismantling the department and moving its programs elsewhere.” HUD remains God’s prize flounder: at a hearing last year, current and former inspectors general recounted story after story of HUD’s being clueless about where its money went. But Congress will never raze HUD’s budget, regardless of how much damage the agency inflicts on urban America. On the bright side, there will always be plenty of “distressed housing projects” that can be targeted for more “shovel ready” spending. Washingtonians view government spending as the equivalent of magic beans that automatically sow blessings across the nation. Any claim of a “multiplier” is treated as a revealed truth. Obama administration officials promised that the stimulus would produce $1.57 in economy activity for each dollar spent, that food stamps generate $1.84 in economic activity per dollar of handouts, and that a dollar of unemployment benefits produces $2 in economic activity. As long as advocates for a government program can invoke some convoluted econometric formula, the program is presumed to be blessed. And it is considered bad form to ask too many questions about the calculus behind the cornucopia. Washington devoutly refuses to recognize the collateral damage from federal programs — from the subsidized loans that allow colleges to gouge students with higher tuition and the agricultural subsidies that inflate farmland prices and price out would-be farmers, to training programs that provide young people only with the illusion of skills. Even when tax-advantaged ethanol boosts smog, damages Americans’ car engines, and drives millions of Third World poor to the edge of starvation with inflated food prices, it remains semi-sacrosanct in the District of Columbia. Proposals to rigorously scrutinize government spending routinely evoke cries of horror. After Barack Obama promised in 2009 that his stimulus plan “cannot and will not be an excuse for waste and abuse,” the Washington Post ran an indignant protest headlined, “The Case for Waste.” The subhead on the article by Post reporter Alec MacGillis captured the enlightened attitude inside the Beltway: “The idea’s to stimulate the economy. So what if we blow a few billion on the wrong things?” George Washington University law professor Steven Schooner perfectly expressed the conventional wisdom: “Are we capable of grasping the concept that in a struggling economy, it’s more important to throw money at the problem, even if it’s possibly inefficient and possibly inaccurate?” The notion of leaving money in private pockets is never considered — perhaps because it would be considered an unnatural act. U.S. military leaders in Iraq spoke of using “money as a weapon” — and as long as handing out billions of dollars created temporary cease-fires, the program was considered a success for the Bush administration. Shortly after the United States invaded Iraq, pallets stacked with newly printed $100 bills were flown into the country and distributed with little oversight to buy friends for the occupation. Similar abuses have proliferated during the war in Afghanistan. Government spending works out well for the political and bureaucratic class even when the money is utterly squandered. Washingtonians are unable to recognize federal failures in part because the political concept of waste is diametrically opposed to the economic concept of waste. In economics, if a company produces something that people value, it can thrive. In politics, if a program garners votes, campaign contributions, or power, it is considered successful. The more money a program wastes, the more gratitude beneficiaries show to politicians. Campaign contributions and reelection rates trump audit reports every time. The size of the federal budget is one of the clearest gauges of the power of the political class over the rest of America. And anything that increases political power will be favored by many politicians. If a policy increases the number of people beholden to them, then it is a self-evident success. Members of Congress brag about the amount of federal money spent in their districts, not about the lack of fraud in programs they champion. Regardless of the severity of the next budget crisis, we will see more charades like the 2011 “historic” budget deal, when Democratic and Republican congressional leaders proudly claimed to have cut federal spending by $38 billion. The Congressional Budget Office later revealed that the actual amount saved was only $352 million in the current fiscal year. Up to $18 billion of the alleged cuts “involve money that existed only on paper and was unlikely to be tapped in the next decade,” the Washington Post noted. Unfortunately, a 99 percent sham rate is about par for “spending cuts” since the Reagan era. Members of Congress will always prefer imaginary budget cuts as long as government spending gives them real power. And much of the mainstream media will help the ruling class pull the wool over Americans’ eyes one more time. Yet despite the government’s record, the nation’s capital presumes that it knows best. Recent gargantuan deficits have not deterred the Treasury from lecturing Americans about how to manage their personal finances (www.mymoney.gov/). Unless average Americans can somehow convert their household debt into the world’s reserve currency, it is difficult to see what lessons Uncle Sam can teach them about managing money. Governments do not fizzle away money in a vacuum. The more of an economy that is subject to political command and control, the greater the forgone opportunities and the less the private prosperity. Governments cannot waste tax dollars without squandering part of the lives of the people who earned those dollars. There are human costs to every government mess. A billion tax dollars wasted preempts 5,000 families from buying starter homes, or preempts a million people from taking summer vacations, or preempts citizens from buying 40 million new books or 70 million cases of beer. The failure of a government policy does not merely reduce the number of bureaucrats who receive “outstanding achievement” job evaluations. Every waste of tax dollars undermines the legitimacy of the entire political system. If members of Congress have a right to seize and squander other people’s money, citizens are nothing more than beasts of burden for political ambition. But few members of Congress ever show sincere remorse for the waste of tax dollars which they authorized the IRS to commandeer from Americans’ paychecks. The Founding Fathers envisioned the legislative branch as a check on the abuses of the executive branch. However, when it comes to squandering tax dollars, members of Congress and bureaucrats are usually in cahoots against citizens. Most members are more enthusiastic about sharing the loot with donors and voters than about ending the waste. Until politicians feel an electoral knife at their throats, it will be business as usual — with a little “Greek-style” dressing thrown in to delude people that problems are being solved. In the meantime, we cannot expect a good-faith reduction in political power from politicians. Americans must recognize how government spending is increasingly endangering their personal and financial independence. Multiple presidents and sessions of Congress have failed to control that spending. There is no substitute for a radical slashing of the federal budget, abolition of vast numbers of government programs, and far more intolerance of government waste. 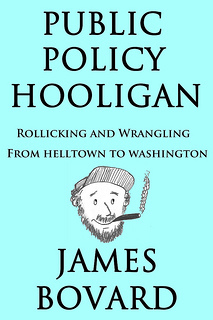 Tagline: Bovard is the author of a new memoir, Public Policy Hooligan and 9 other books and a regulator contributor to the Future of Freedom Foundation.